Desk Gadgets for a Brighter Workplace! Brand new to Gadget Inspector is the awesomely Pinart 3D Image. You’ve probably seen these delicious desk gadgets before; they’re basically a screen of small pins into which you press objects or body parts to create a 3D relief image to proudly display on your desk. Hands and faces are popular choices – pressing your palms into that screen of sliding pins is a lovely sensation. Just try to resist it! Elsewhere in our range of desk gadgets you’ll find the equally brand new Newton’s Cradle, where science meets style in a clattering collision of procrastination. The sound of those little silver balls clacking against each other can be surprisingly compelling, so grab one today and put Newton’s Laws of Motion to the test! Every action has an equal and opposite reaction, don’t cha know, and sure enough, the number of balls you lift up to start the reaction will be equal to the number of spheres that gets knocked away from the row on the other side. One ball knocks one ball away, two balls knock away two, and so on. Who knew desk gadgets could be so educational? Have you entered our Gadget Competition yet? 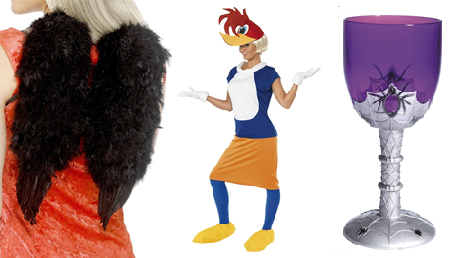 WINnie Woodpecker, a set of angel WINgs, and a creepy WINe glass. Have you seen the Gadget Inspector Facebook page? No? Well you've been missing out on many a great gadget competition over the past couple of weeks. We recently announced that we would be dipping into our pile of cool gadgets and giving away a cool prize every week until Christmas, so don't worry if you didn't win a Remote Control Cy-Bug or one of our fabulous fancy dress costumes - there are still loads of gadget competition announcements to be made, and plenty of cool gadgets to be won! To enter the gadget competition, all you have to do is click 'Like' and share the deal of the week with your friends. We'll pick a winner the following Friday, and that lucky lad or lassie will receive an awesome gadgety prize! We're giving away a different prize every week, so even if you don't fancy this week's prize, next week's could be right up your street! You could win all manner of cool gadgets with only a few clicks of that there mouse. This week's prize is a smashing Space Rail - a brand new toy that really has the wow factor! If you want to win one, all you have to do is head over to the Gadget Inspector Facebook page and enter our gadget competition - just Like and Share this week's deal, and you'll be in with a chance of winning some seriously cool gadgets. Cool gadgets and unusual items to get you in the festive mood! Being as it's not even November yet you might think it's a bit early to start talking about Christmas present ideas, but once Halloween and Bonfire Night are out of the way, December the 25th will be rushing towards us faster than a rocket-powered reindeer. The longer you leave it, the harder it will be to get anything good, so why not have a poke around Gadget Inspector's catalogue of cool gadgets now, and get the Christmas shopping done early? We've got a great gift for everyone here at Gadget Inspector, so whether you're buying for your parents, your kids, or somebody in between, we're bound to have some cool gadgets that will make their Christmas morning. Little'uns are easy - what child wouldn't love playing with our Remote Control Inflatable R2D2 while they wait for their Christmas lunch? We've also got a heap of Christmas present ideas that will appeal to the slightly older child, including this fantastic Remote Control Quadrocopter which flies through the air and even does 360-degree flips in mid-air! Be warned, though - cool gadgets like this can lead to a serious battle for the controller, especially if Dad likes his remote control helicopters. Speaking of Dad, we've got a range of cool gadgets and Christmas present ideas for slightly older family members, too - Dad can soothe his aching bones with our selection of marvellous massage gadgets, while mum can enjoy a cup of Christmas tea out of her brand new mug. If you're short of Christmas present ideas, our website is packed with cool gadgets that will suit everyone's needs. We've got something for all the family, so get stuck in and remember, it's better to give than to receive! If it's someone's birthday and you're out of present ideas, Gadget Inspector's got a Batcave full of brilliant Batman stuff that's sure to please comic book geeks and movie buffs alike. Us lot are big fans of Batman in all his forms, whether he's beating up bad guys in comic panels or starring in his very own epic movie trilogy, so it should come as no surprise that we've loaded a good-sized portion of our website up with Batman stuff in honour of everyone's favourite Dark Knight! Let's start at the top with our range of fantastic Batman costumes. Halloween is just around the corner, but even once the 31st of October is over and done with, a good costume can come in very handy for Christmas parties, birthdays, and all kinds of other fancy dress occasions. But costumes are just the tip of the Batman stuff iceberg. We also have a bunch of Batman cufflinks which allow you to bring a bit of the Caped Crusader's signature look to your formal clothes. The iconioc Bat logo is instantly recognisable, so we've incorporated it into a bunch of our Batman stuff to make it look super striking. Last but not least in our Batman stuff rundown is our collection of Batman wallets. The World's Greatest Detective is the perfect person to keep an eye on your cash - his menacing visage is sure to put off any pickpockets you might encounter! So that's about it for our Batman stuff. If you need a gift for yourself or a nerdy friend, you'd do well to investigate our range of gifts and gadgets inspired by the Man of Steel! Or is that Superman...? Remote control fun comes in all shapes and sizes, so don't worry if you're sick of RC cars and RC helicopters - there's plenty more fish in the sea. Literally, in some cases. Air Swimmers are the remote control inflatable that, as the name suggests, look just like they're swimming through the air. They need a bit of helium to get them in the air, but once they're up you'll never want to bring them down again! Remote control fun takes on a whole new dimension when you can sneak up on people a big flying shark and surprise them. But there's another remote control inflatable we love, and just because he can't fly doesn't mean he isn't a great big bag of remote control fun. Remote Control Inflatable R2D2 is great fun for kids and adults alike; you'll love making him spin round and round, and if you knock him down, he'll get straight back up again! So as you can see, there's a lot of fun to be had when you've got a remote control inflatable to play with. You'll find all of these awesome items in our Remote Control section, along with all kinds of other remote control fun. Take control today!